SELEX Galileo, a Finmeccanica company, is a leading global player in defence electronics, and delivers airborne mission critical systems and a full ISTAR capability for the battlespace to its customers. In the Land, EO and Battlespace sector, the Company draws from its unique experience to develop tailored systems and solutions to improve situational awareness in the continuously changing battlefield. The Individual Combat Fire Control and Observation System is a family of products developed by SELEX Galileo to meet the evolving needs of today and tomorrow’s warfighters. This family of products has been designed to increase the capabilities of infantry as far as lethality, C4I, survivability, mobility, sustainability and situational awareness are concerned, taking into account the continuously changing operational scenario from symmetric to asymmetric threat, from open to urban terrain combat area. Today’s forces must be rapidly deployable in operative theatres and the lessons learned from recent military international operations have significantly modified the NATO Soldier Requirements, emphasising how a quick reaction time in close combat is not only life saving for the soldier, but it makes him a key player in the battlefield. Having the ability to react quickly also provides the opportunity to acquire, elaborate and diffuse critical tactical information for the friendly network to increase the mission effectiveness and efficiency. In regards to the Individual Combat Fire Control and Observation System SELEX Galileo, an Italian leader in Electro-Optics equipment, has transferred its heritage in fire control systems for land applications into a compact, lightweight family of products that applies the ultimate small-scale technology in the field of electronics and processing, micro-electro-mechanical systems (MEMS) optics and advanced algorithms. 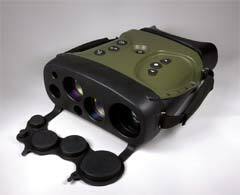 There are four SELEX Galileo products in the soldier suite: the Aspis thermal weapon sight, the Scorpio grenade launcher Fire Control System (FCS), the Nimos helmet eyepiece and the hand-held binocular Linx, a target locator. 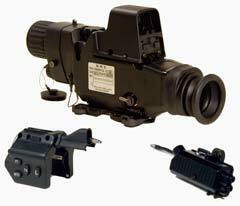 ASPIS is a state-of-the-art thermal weapon sight for assault rifles. It enhances the typical mission performance by equipping the user with the capability to observe, aim and diffuse images of a target. ASPIS combines day and night video channels with visible and invisible laser pointers and a red dot for short distance combat operations. 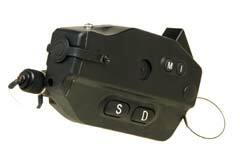 ASPIS is a state-of-the-art thermal weapon sight for assault rifles. Furthermore, a wireless transmission of day and night video signals processed by the ASPIS enables the soldier to observe and fire ‘around the corner’ and records snapshots of the scene via the receiver computer. Picatinny MIL standard mounting compatible. LINX is a binocular hand held target locator. Its suite of sensors is packaged in a lightweight unit that is designed for Infantry squads and special and law enforcement forces that use forward observers and reconnaissance patrols. LINX enhances the situational awareness during a mission by providing the capability to acquire and process a target’s data by recording its range, the relative angular position (azimuth and elevation) and the observed scenery with its Infrared or TV-CCD channel. A Global Positioning System (GPS) can also be added to the device in order to provide the user’s position. The target digital data package, once acquired, can be transmitted with a wireless data link to the C4i network. Self-powered by rechargeable lithium batteries or by Soldier System batteries, as back-up. SCORPIO is a lightweight and compact Fire Control System (FCS) for 40mm under barrel grenade launcher tubes, providing fast and accurate aiming and firing capabilities. A ballistic computer provides enhanced first hit probability against static or moving targets, which reduces the fire reaction time. The unit can be reconfigured by uploading different firing tables (HE Frag, HEDP, etc.) and the selection can be quickly made on the field. Selectable firing tables to shoot different ammunitions. 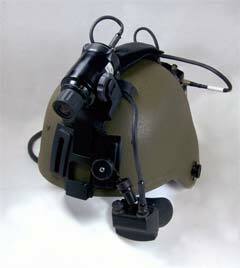 NIMOS is a modular, lightweight, helmet mounted eyepiece integrated with a low light level digital TV for soldier night mobility. NIMOS can receive and display the ASPIS Rifle Sight IR or TV video channels via wireless link and displays digital maps, images, messages and alarms from the Soldier’s Wearable PC linked to the C2/C4i network. Enhanced ergonomics and lightweight equipment made of composite material. The Italian Army Soldier System, which is fully interoperable and integrated into the latest C4i Systems, is one of the most advanced and complete European program for Infantry modernisation, complying with the requirements of the Italian Army and meeting the NATO guidelines. 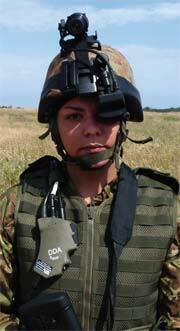 SELEX Galileo has been the first company to develop a secured wireless link between the rifle sight and the helmet eyepiece display to implement the “shoot-around-the-corner” capability and to monitor the physiological stress level of the soldier in operation. The proprietary multi-sensor Individual Fire Control and Observation System equips the infantry with a real “all weather” H24 operation capability for target observation, location and sighting. Key target data can be transmitted to the C4i network and the advanced FCS, as the 40mm under-barrel grenade launcher provides the soldier with the possibility to use such a weapon in parallel with the standard 5.56mm - even at night and with the highest ever accuracy up to a 400m range. The assault rifle in this configuration becomes a multi-calibre device that is enabled by the thermal weapon sight and a further eye of the team that inputs into the C4I network.